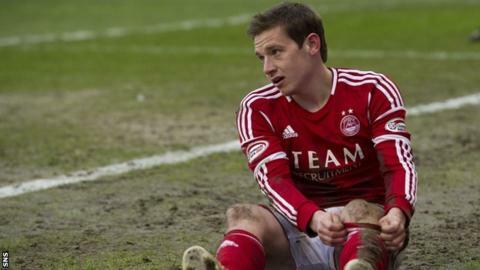 Craig Brown admits last year's rugby match at Pittodrie combined with bad weather has affected Aberdeen's pitch. Scotland took on Tonga at the Dons' ground in November. "There was a scrummage outside the tunnel and it lasted quite a while," said manager Brown. "That wouldn't make it easy for the ground staff. "I'm not blaming the rugby. What damaged the pitch more was the unfortunate weather we had against St Johnstone [in December]." Brown feels an artificial surface would have helped during that 0-0 draw and added he would accept such pitches in the Scottish Premier League "with reluctance", with the former Scotland boss still preferring traditional grass parks. "The artificial surfaces are getting better and better," he explained. "The fourth generation one, which is currently in vogue, is good. "Arguably the best performance from any Scottish team this season was on an artificial surface and that was when Celtic played Spartak Moscow [in Russia]. It's a consistent surface. "Players who have had an injury suffer a bit on the artificial but, by and large, they should be able to make them good enough to simulate grass. "The ground staff are working tirelessly to make the [Pittodrie] pitch as good as it can be and it's not only our pitch that's under the effects of the weather." Meanwhile, PFA Scotland have agreed to help the Scottish Football Association conduct a survey of more than 1,000 registered players into the use of artificial surfaces. "The debate on 3G pitches is one that has taken place for years but without any real input from those most affected by it - the players," said the union's Stuart Lovell. "We realise that the continual improvement in artificial pitch technology makes for a more meaningful debate."